In the previous post in this mini-series, we installed the Network Load Balancing feature on each of our Management Servers. Now we will create a NLB cluster. Host parameters, which are specific to each host in a NLB cluster. Cluster parameters, which apply to an NLB cluster as a whole. Port rules, which control how the cluster functions. By default, a port rule equally balances all TCP/IP traffic across all servers. Some applications may require different or additional port rules to operate correctly. For example, when using NLB in a Remote Desktop Services environment, you will need to modify these default rules. As a reminder, we’ll break the articles/posts down into smaller pieces. Here is a high-level of each piece. Let’s continue with the third step. Now that the Network Load Balance feature is installed on each Management Server, we can now create a cluster. Let’s log into our first Management Server to begin. 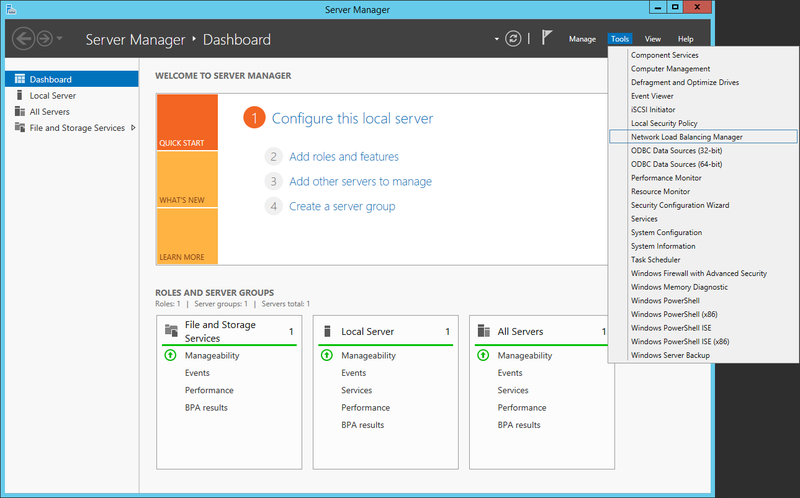 Start by launching Server Manager, click on Tools, then click Network Load Balancing Manager. To connect to the host that is to be a part of the new cluster, in the Host text box, type the name of the host, and then click Connect. In Host Parameters, select a value in Priority (Unique host identifier). This parameter specifies a unique ID for each host. The host with the lowest numerical priority among the current members of the cluster handles all of the cluster’s network traffic that is not covered by a port rule. You can override these priorities or provide load balancing for specific ranges of ports by specifying rules on the Port rules tab of the Network Load Balancing Properties dialog box. In Host Parameters, you can also add dedicated IP addresses, if necessary. In Cluster IP Addresses, click Add and type the cluster IP address that is shared by every host in the cluster. NLB adds this IP address to the TCP/IP stack on the selected interface of all hosts that are chosen to be part of the cluster. NOTE: NLB does not support Dynamic Host Configuration Protocol (DHCP). NLB disables DHCP on each interface that it configures, so the IP addresses must be static. In Cluster Parameters, select values in IP Address and Subnet mask (for IPv6 addresses, a subnet mask value is not needed). Type the full Internet name that users will use to access this NLB cluster. In Cluster operation mode, click Unicast to specify that a unicast media access control (MAC) address should be used for cluster operations. In unicast mode, the MAC address of the cluster is assigned to the network adapter of the computer, and the built-in MAC address of the network adapter is not used. It is recommend that you accept the unicast default settings. In Port Rules, click Edit to modify the default port rules, if needed. Then click Finish. Back in the Network Load Balancing Manager, the new cluster will appear with the IP Address assigned, and the host we added will show as started. Now our first Management Server has been added into the NLB Cluster. In the next post in this series, we will move onto Step 4: Enable NLB on each Management Server > Add A Host to NLB Cluster.